Описание The FORCE model represents KBC’s performance lineup. Incorporating a progressive design and a new interior fit platform, the Force model offers the ultimate in comfort and performance. The FORCE RR features a sophisticated 12 air-intake ventilation system allowing superb levels of comfort and functionality in all climates and conditions. The functionality of the FORCE line, make them ideal for long road trips as well as shorter performance rides. 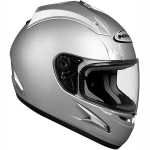 - Shell: POWERCORE Shell constructed using an advanced alloy resin, resulting in a high energy absorption helmet. - Ventilation: DUAL-INTAKE VENTILATION SYSTEM(DiVS), efficiently draw, circulate, vent and control airflow providing ultimate comfort. - Shield: QUICK RELEASE VISOR PLUS(QRV+), optically correct, scratch resistant, anti-fog shield utilizes a tool-less QVR+ system and seals securely when closed to the helmet’s RIB system. - Interior: DURALUX LINER, removable, washable, liner with customizable padding system. - Safety Standard: Meets or exceeds SNELL/DOT standards.